CNEWA’s president Msgr. John E. Kozar is on a pastoral visit to Iraq, along with Cardinal Leonardo Sandri, prefect of the Congregation for the Eastern Churches. The cardinal, in his second trip to Iraq, brought Pope Francis’ blessing to Iraqi Christians and transmitted the acknowledgement and encouragement of the Authorities for their work in the difficult current context of Iraq in favour of Christians, other minorities and those who suffer as a result of the violence. From 1 to 3 May Cardinal Sandri visited Baghdad where he celebrated the Divine Liturgy in the Chaldean Cathedral of St. Joseph and lunched with refugees assisted by various ecclesial institutions. In Erbil, the capital of Iraqi Kurdistan, he met with the Roaco delegation which is planning aid projects in various areas of pastoral life and in the assistance of refugees. ...Cardinal Sandri concluded his address by invoking the protection of Our Lady and of St. Peter for Pope Francis, “always so close to the Christians of the Middle East and to all those who are persecuted,” and for their Beatitudes the Patriarchs Louis Raphael I Sako of the Chaldean Catholic Church, and Ignatius Joseph III Younan of the Syro-Catholic Church. To help those seeking to rebuild their lives in Iraq, and support CNEWA’s mission there, please visit this giving page — and keep our brothers and sisters in Iraq in your prayers! Jahd Khalil writes about efforts to rebuild religious institutions in Suez in the Spring 2015 edition of ONE. Below, he offers personal impressions from his trip there last winter. Last Christmas season there were plenty of images in press coverage of Egypt of congregations praying in burned-out churches, but I only experienced the atmosphere and feelings of it on this recent trip to Suez. It was a few days before Epiphany, and it brought to light the gravity of the situation for this congregation and the implications of all the little things that were lost. Franciscan Father Gabrail Bakheet was dressed in his white liturgical robes. While giving us a tour of the vestry, he pointed out that the diversity in vestments meant that so many had to be replaced. The congregation also had to sing hymns without hymnals. Christmas is one of those times when you reflect on family, friends and community, but there were so few people in the church that the hymns only highlighted that the scarcity of people. The many who once might have been signing these hymns just weren’t there. The US invasion of Iraq, the civil war in Syria, and general unrest across the Middle East have made religious life more difficult for Christians and other minorities. It felt quite lonely in that burned-out, cold church. One thing that struck me while reporting this story is the amount of faith Christians have put in their government’s support for their communities. The Maspiro massacre — in which 28 people, mostly Christians, died while protesting for religious freedom — is not a distant memory. But there has been a willingness to overlook it in order to try and preserve what is left of the long Christian tradition in Egypt. I really admired the sisters’ perseverance and good spirits in the face of adversity and isolation. Here they were in one of the most densely populated countries on earth, but still alone in many ways. In this image from October, Argentinian Cardinal Leonardo Sandri, Prefect of the Congregation for Eastern Churches, leaves the Synod Hall at the end of a session of the Synod on the themes of family in Vatican City. He’s now making a pastoral visit to Iraq. 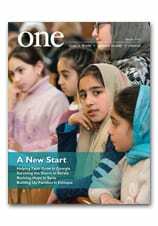 In the Spring edition of ONE, writer Dale Gavlak reports on the plight of Iraqi Christian refugees who are seeking sanctuary in Jordan. One place they are receiving help: the Italian Hospital in Amman, which has long been supported by CNEWA. They also arrive with physical wounds or with psychological scars that come with being torn from their homeland. Sister Elizabeth said that at Christmas, the hospital took up a collection to give their patients a little bit of money. “You know what they said? ‘We don’t need your money. Give us a future,’” she recalled. Money is hard to come by, the hospital staff acknowledged. The charges to the private patients help pay for some of the charity care the Italian Hospital provides. But “we have to squeeze,” Sister Elizabeth said. “Sometimes we don’t know how we are going to pay the staff,” which numbers 130. Read more about the challenges refugees are facing and how the Italian Hospital is trying to help. The video below takes us inside this important facility and offers a glimpse at some of those being helped. To learn how you can support Iraqi refugees, please visit our giving page. And remember to keep all our suffering brothers and sisters from Iraq in your prayers. Children socialize outside the Good Shepherd Sisters’ school in Deir el Ahmar, Lebanon. Read more about caring for children and refugees in Lebanon in the Spring 2015 edition of ONE. In this image from February, U.S. European Commander Air Force Gen. Philip Breedlove conducts a news briefing at the Pentagon in Arlington, Virginia. Gen. Breedlove said yesterday Russian-backed forces appear to be preparing for a new offensive in Ukraine. As a 12-year-old Catholic boy growing up in England, Michael Fitzgerald decided he wanted to be a missionary in Africa. Eight years later, he was studying theology and learning Arabic in Tunisia. He went on to devote his priestly ministry to the promotion of interfaith understanding between Muslims and Christians, and became one of the top Roman Catholic experts on Islam. He has served as the archbishop of Tunisia, the papal nuncio — effectively a Vatican ambassador — in Cairo, and the Vatican’s delegate to the Arab League. For years, Fitzgerald has been urging his fellow Christians to acquaint themselves with Islam and its holy book, the Quran. It has been a challenging mission at a time when many non-Muslims associate Islam with violence and when many Muslims think the West has declared war on their faith. As a university professor in Uganda, his classes on Islam included some Muslim students. Now retired, the archbishop has turned his attention to writing and lecturing; this spring, he is a guest instructor at John Carroll University, a Jesuit institution in Cleveland, where he is teaching a course on the Quran to a small group of undergraduate and graduate students. In his class he often highlights differences between Christianity and Islam, though in such a way as to encourage respect for distinctive Muslim approaches. “In our ceremonies we read the scripture — the Gospel is read,” he said in a recent classroom session. “In Islamic prayer, it is not read, it is recited. The imam has to know the Quran. So it’s very good to become a ...,” and then Fitzgerald wrote the word hafiz on the blackboard, explaining that it means someone who has memorized the Quran from start to finish. Read more about his class at NPR.